Pilgrims (Henro in Japanese) have special expectation on Okuboji, known as the last of the Shikoku pilgrimage’s 88 temples, since their long journey finishes at this temple. 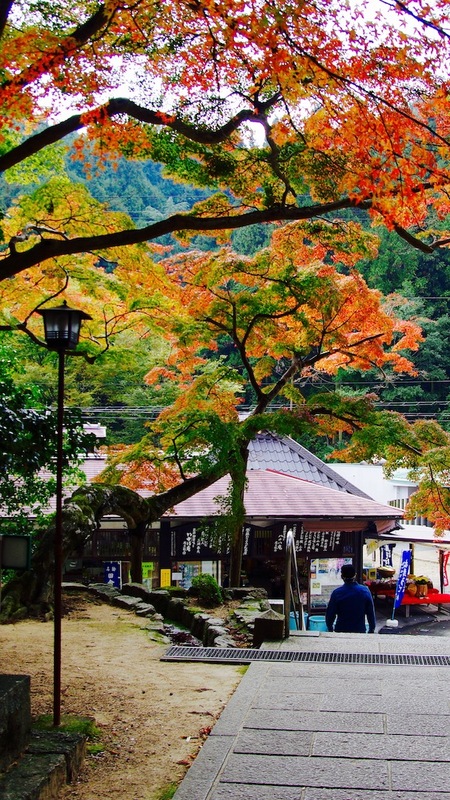 From the end of October to the beginning of November, Okuboji, where only pilgrims and worshippers usually visit, is filled with lots of leaf peeper. 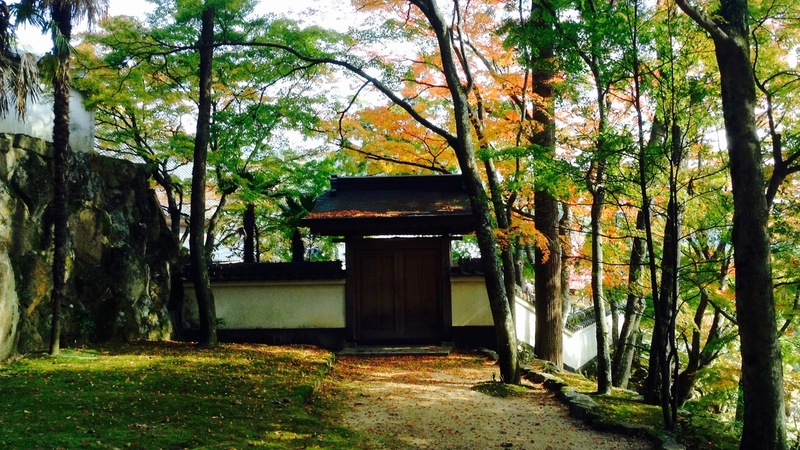 I heard the maple leaves started changing the color in early November and visited this temple in beautiful autumn day. 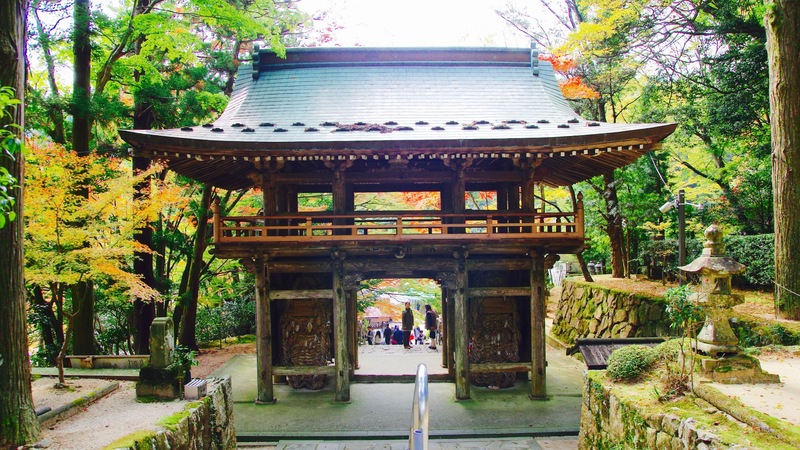 Nitenmon gate, which was named after that Brahma and Taishakuten were worshipped, is the entrance of Okuboji. Most of the people enter this gate and head for the main hall to pay their respects at. 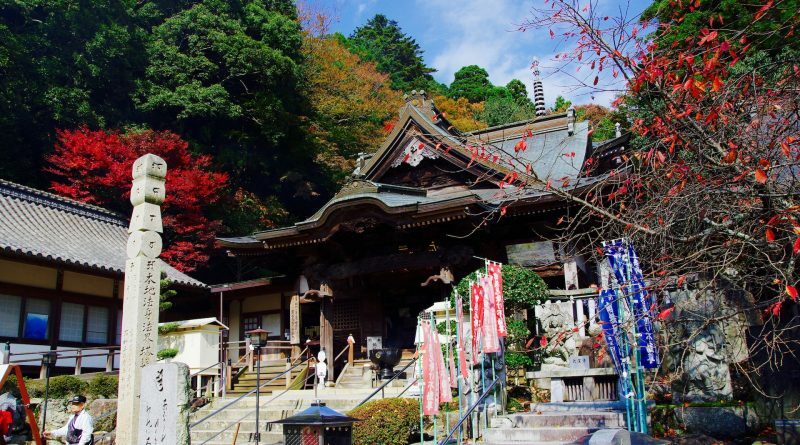 Climbing the stone steps and entering this Nitenmon gate, red leaves with bluish tone were so beautiful and attractive. When I turn my face back, mountains at a distance seem to embrace this calm Okuboji. On the other hand, Yasoba-an in front of the gate is crowded with people who aim at Uchikomi Udon. 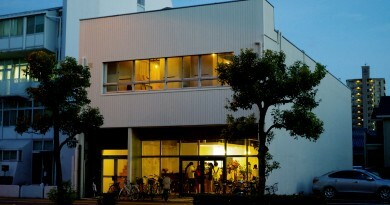 It creates the contrast with the quiet temple and gives this place the energy. 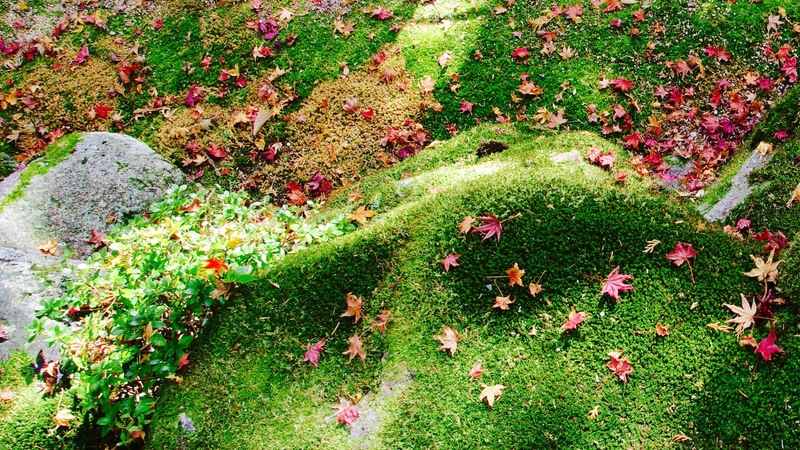 Inside the temple grounds is colored with fallen yellow gingko leaves. 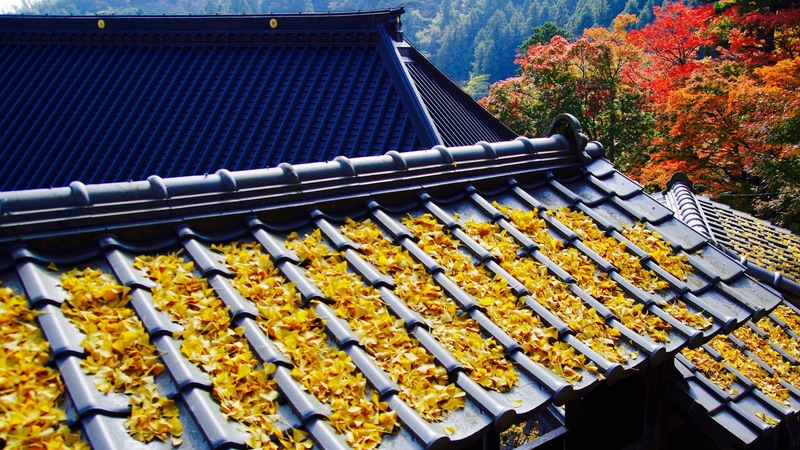 The leaves on the roof make contradistinction with burning red leaves around. 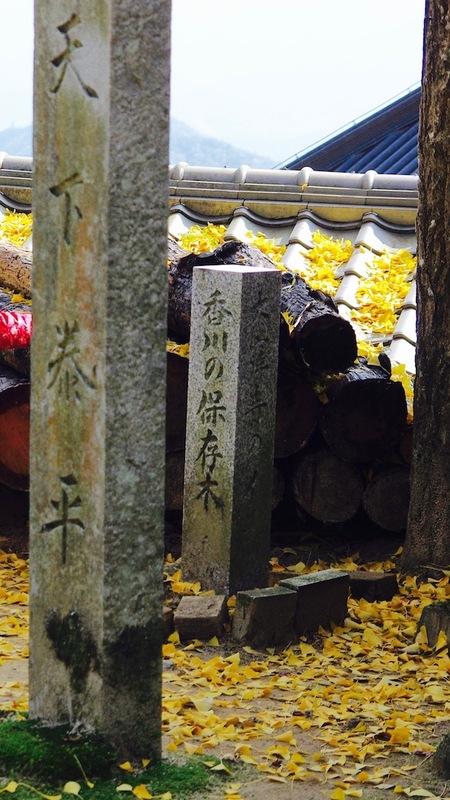 There are two Kagawa’s preserved trees around Okuboji and both of them are more than 100 years old. One of them is 26 meters tall and 600-year-old gingko tree. The monumental stone at the bottom tells us how this large tree has been taken care of. 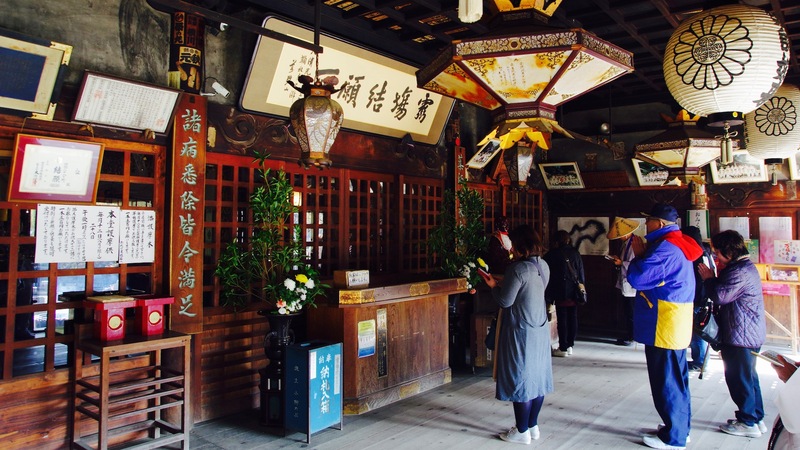 Once pilgrims enter the main hall after rough 16 km journey from 87th temple Nagaoji and chant Buddhist sutra with joining their hands in prayer, the laborious efforts should disappear with rising incense. 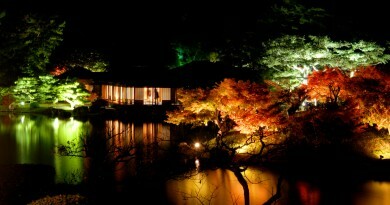 When I reached Honbou after a walk along narrow pass with watching the colored leaves, my stomach growled. I was going to Yasoba-an which is very famous for its traditional local dish “Uchikomi-udon”, though the huge line in front of this restaurant made me give up. Then I decided to have lunch at Nodaya located at the bottom of the stone steps towards Okuboji. 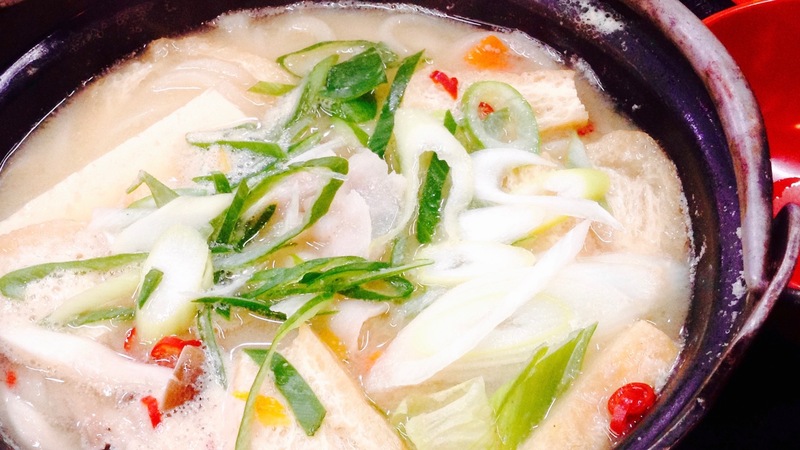 This local dish has been one of homemade foods among farmers in this mountain area and most of the normal Udon restaurants do not serve this. For that reason, lots of people would think “As I came this far, it’s a shame not to have this Udon” even they have to stand in the long queue. 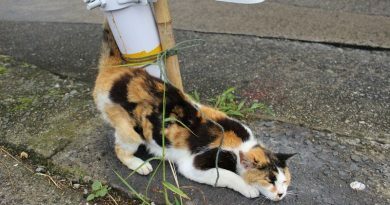 50-year-old Nodaya stands at land slide prevention wall. Large rock bares inside wall and it makes the atmosphere loutish. Nodaya’s Uchikomi-udon is filled with burdock root, carrot, taro and pork with peels of Yuzu, red hot chili pepper and green onion on. More you eat, the more these spices smell great. There is a cold bared rock in this restaurant but you should get hot from head to toes when you have this dish. As it is inconveniently located, you should not visit here very often. Though when you would like to relax in calm place far from busy town, mountain scenery and chanting Buddhist sutra should make you feel comfortable.